What is Legalon used for? Legalon has been shown in clinical trials to support healthy liver function. Legalon contains a specific extract of Silybum marianum (MZ 80) that has been used in numerous clinical trials and is the benchmark silymarin product worldwide. Legalon capsules are produced using a patented process, resulting in a standardised product with excellent bioavailability. Legalon is clinically proven, it is the exact product that has been used in numerous clinical trials. This is very important for natural medicines as there can be great variance between products, even if they appear to use the same active ingredients, due to the part of the plant that is used, as well as the growing, harvesting and production conditions & methods. The outcomes of clinical studies for natural medicines should therefore only apply to the exact product that has been tested. As a result, other products containing silymarin may not deliver the same results that Legalon has demonstrated in the research. Once the desired therapeutic outcome is achieved, the dose may be reduced to 1 capsule twice daily for maintenance. How does Legalon differ from other silymarin products? Legalon is clinically proven, it is the exact product that has been used in numerous clinical trials. This is very important for natural medicine as there can be great variance between products, even if they appear to use the same active ingredients, due to the plant that is used, growing methods, harvesting processes and manufacturing methods. The outcomes of clinical studies for natural medicines may therefore only apply to the exact product that has been tested. 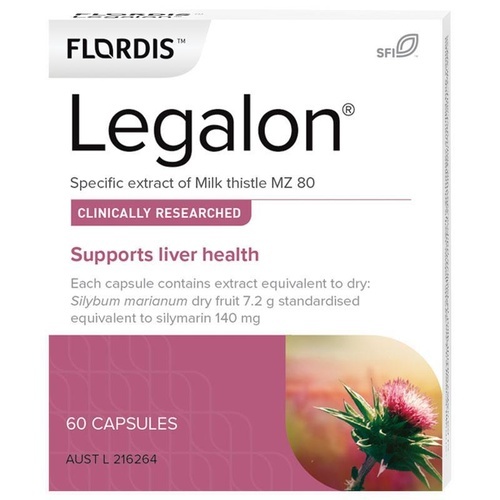 As a result, other products containing Milk thistle cannot be expected to deliver the same results that Legalon has demonstrated in the research. Does it matter if Legalon is taken before or after food? Legalon can be taken on an empty stomach; this has the advantage of allowing the active agent, silymarin, to be more quickly absorbed into the body – therefore acting more rapidly and effectively. However, if you are experiencing any gastrointestinal problems, Legalon can be taken during or after meals. Can Legalon be used in pregnancy and lactation? Legalon is not recommended during pregnancy or lactation as there are no published studies to establish its safe use during pregnancy or while breastfeeding. Can Legalon be given to children and adolescents? Where appropriate, Legalon can be prescribed for adolescents 12 years and older. If you have specific questions or concerns, it is important to speak with a healthcare professional. Are there any side effects to using Legalon? Legalon is generally very well tolerated and no serious side effects have been recorded. In rare cases, a mild laxative action has been observed after taking Legalon. It is important to speak with a healthcare professional if you are concerned about possible side effects. Does Legalon interact with any medications? There are no known interactions between Legalon and other medications.5 If you are concerned about taking Legalon with any prescription medications, it is important to speak with a healthcare professional. No, Legalon does not contain lactose. Will Legalon affect my ability to drive and use machines? Legalon capsules have no known adverse effects in these situations. Some of this research was conducted using funding provided by Rottapharm/Madaus, manufacturer of Legalon.